HTC has unveiled its latest smartphone, known as HTC Touch2. The compact and stylist form factor form has been preloaded with the Microsoft latest Windows Phone software, Windows Mobile 6.5. The HTC Touch 2 is the first ever HTC phone which runs on Windows Mobile 6.5 and new Windows Phone services like My Phone and Windows Marketplace. With the new Windows phone software, the HTC Touch2 is expected to deliver an exceptional experience that make it easier for users to stay connected with their friends. Featured with TouchFLO interface that provides access to calendars, contacts, media and the web, HTC Touch2 is also incorporates Google Maps for Mobile, YouTube and etc. Besides, it allows users to check and manage multiple email accounts. In addition, the phone is also packs in a zoom bar. Processor: Qualcomm MSM7225, 528 MHz. Display: 2.8-inch TFT-LCD touch-sensitive screen with QVGA resolution. Camera: 3.2 megapixel color camera with fixed focus. Expansion slot: microSD™ memory card (SD 2.0 compatible). Dimensions: 104 X 55 X 12.9 mm (4.1 X 2.16 X 0.51 inches). Memory: ROM: 512 MB, RAM: 256 MB. Weight: 110 grams (4 ounces) with battery. Connectivity: Supports Bluetooth and Wi-Fi. 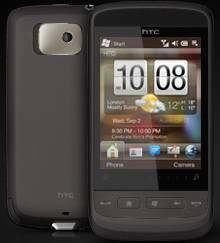 The HTC Tocuh2 is expected to be available on October 6 in European and Asian markets in early Q4 2009.